Spring comes a little slower in Yellowstone than most other places, but it’s an awesome spectacle when it grudgingly arrives. While the Canyon area still has snowpack (including most campsites and hiking trails), the western and northern parts of the park are teeming with signs of spring renewal. Meadows are becoming green and lush. Streams are briskly flowing. And new wildlife is everywhere. 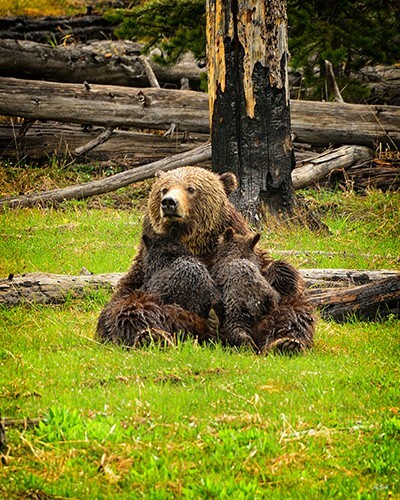 Near Gibbon Meadows, we had the fortunate experience to see a new grizzly mother with two cubs, born during hibernation. The sow was across the Gibbon River from onlookers and seemingly oblivious to our presence. At one point the happy mom nursed the youngsters before returning to her quest of finding nourishment from anything edible in the moist soil. 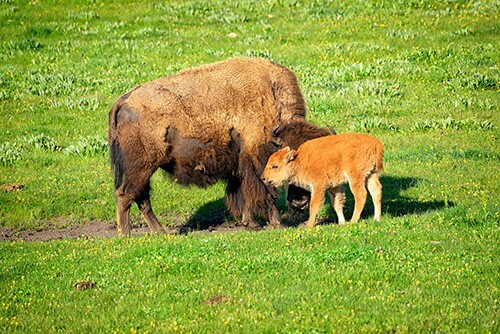 Other new moms include the bison, all through the park, but most abundantly in the Lamar Valley. 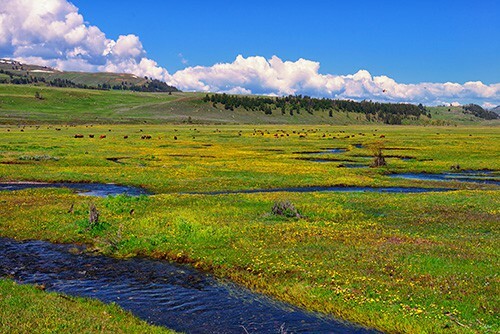 This remarkable valley becomes lush and green before most other parts of the park, and it’s packed with bison in the spring. Each day more and more newborn bison arrive. These “red dogs” stick close to their mothers and are protected by the whole herd from any potential threats. Wildflowers are starting to blossom throughout the Lamar Valley and to the west. Lupines and arrowleaf balsamroot flowers are popping up along the northern corridor of the park. Over the next few weeks more and more of our first national park will escape the grips of a long winter, ushering in the lush vibrancy of Yellowstone’s most glorious season.